Terry McGinnis takes on the Batman cowl amid rumors that the original Joker has returned. An entire section of Gotham City has descended into the Jokerz' hands, creating a community of clown-worshipping crazies called Jokerztown! Rising from the chaos, Terminal unifies the gang of Jokerz and he's after the new Batman. 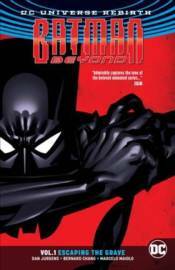 Collects issues #1-5 and BATMAN BEYOND: REBIRTH #1.